1. Studies of a Dead Sparrow. 1889-90. Chalk on paper. Van Gogh Museum, Amsterdam. The numbered illustrations to this post were each part of the exhibition and can be enlarged by clicking on them. The surest bet in the museum world (other than, I suppose, animatronics dinosaurs) would be to mount a show of four dozen or so of the major works of Vincent van Gogh. This summer the Sterling and Francine Clark Art Institute in Williamstown, Massachusetts cashed in on such a bet with its “Van Gogh and Nature” exhibition. The two weekdays that I visited the exhibit saw the museum overflowing with visitors, the fields around the museum crammed with cars like a state fair, and the single country road that leads to the museum lined with parked cars for a half mile or so in each direction. What was remarkable about the crowds is that Williamstown is far from any major urban center: more than three hours from Boston and New York by car, two from Hartford and an hour from Albany. And the trip is not particularly easy. The last half hour has to be driven on narrow single lane (in each direction) country roads with no passing the tractors or slow delivery trucks that also have to use the roads. (This is at least my conclusion relying on my GPS and google maps. I was unable to find a limited access highway anywhere near Williamstown.) 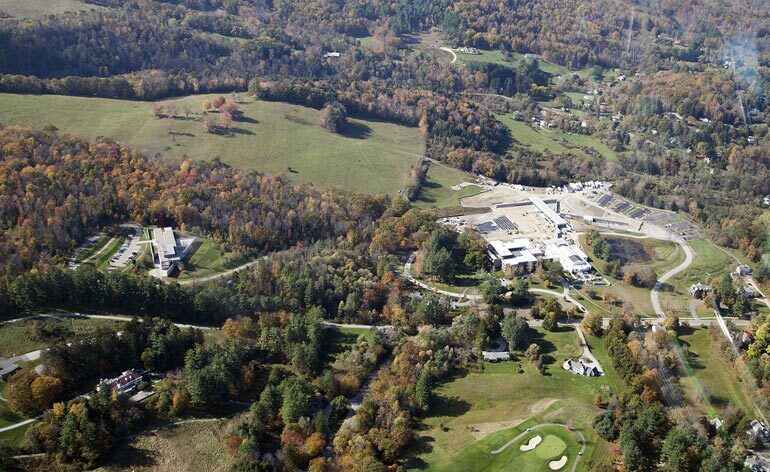 I suppose that vacationers in the Berkshire resorts made up a good number of the visitors, but they could hardly provide the immense crowds that the event attracted. Many families brought (clearly bored) children, and not a few of the adults walked about aimlessly with glazed eyes. So many must have come with a sense of duty. What is it about van Gogh that produces this response? 2. Hospital at Saint-Rémy. 1889. Oil on Canvas. Hammer Museum, Los Angeles. Van Gogh’s powerful attraction to the modern mind, not just those interested in art history, is such that even children know of him. On a superficial level many of his well-known oils are easily remembered owing to their idiosyncratic design, their bold colors and their dramatic brush work. But it is van Gogh’s struggle with his circumstances and with his personal demons that most strongly engages us. Van Gogh endured grinding poverty almost all his adult life. He had only one adult relationship and that was with Sien Hoornik, a prostitute who was pregnant when he began living with her. 3. Wheat Fields with Reaper, Auvers. 1890. Oil on canvas. Toledo Museum of Art. She proved to be less mentally stable than he was, which brought their relationship to an end, but her threats of suicide proved prophetic (she drowned herself just as she claimed she would die). Van Gogh himself showed symptoms of a variety of mental disorders and spent much time in severe depressions. He was even involuntarily committed to an asylum, which proved to be relatively enlightened (in one of the few breaks fortune dealt him). And when he finally achieved the artistic breakthrough that he alone thought himself capable of, he killed himself, following a logic that was personal to himself alone. Legends surround romantic geniuses that shared only one of those afflictions. Van Gogh carried them all on his back and forged a new art all within ten years of his beginning to study to the very end. 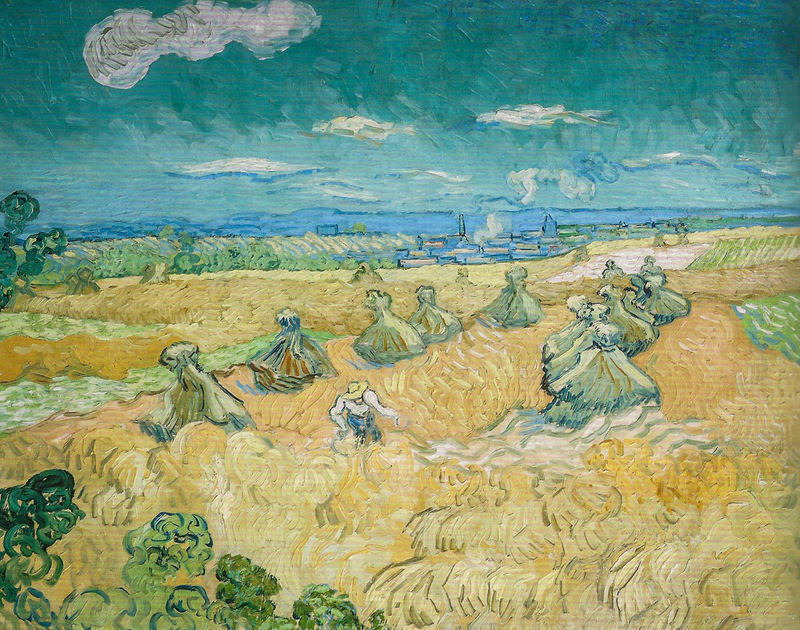 If that weren’t enough his new art emphasized yellow fields, open skies and the light of the sun, so the myth of van Gogh follows that of Icarus, but van Gogh populated his own journey with reapers. If van Gogh had not existed, modernity would have had to invent him. 4. Marsh with Water Lillies, Etten. June 1881. Ink on paper. Virginia Museum of Fine Art, Richmond. Van Gogh, however, was something other than merely a tortured artist. He was also an obsessive self-analyst, and he recorded his attempts to understand his inner driving impulses and their obstacles. His letters were revelatory, especially those to his younger brother Theo. Theo was not only Vincent’s confident, but also an art dealer. For many years Theo was an employee of a major art trading house Goupil & Cie with offices in many cities, which both Theo and Vincent worked for at the recommendation of an uncle who had an interest in the firm. It was that uncle who had helped transform Goupil & Cie from a firm that mainly dealt in prints of artworks to one that also sold paintings and drawings. Theo was also, perhaps most importantly, Vincent’s chief (and often only) patron, supplying him with funds to live on, money for oils and canvases and other equipment. Theo’s funds were also a psychological prop for the increasingly unstable Vincent. All told, we would not have the great works of Vincent van Gogh without Theo. From Theo’s point of view, his support of his older bother was probably the most significant thing in his life. He died at 33, six month’s after Vincent’s suicide, from (syphilitic?) dementia, ruled to have been caused, in part, by sadness.Thanks to the Van Gogh Museum, the Huygens Institute and the Vincent van Gogh Foundation, English readers have access to van Gogh’s letters in English translation with scholarly annotations and the sketches he enclosed (and much other material) on the web-hosted Van Gogh Letters Project. * The letters are the are the best companion to any showing of van Gogh’s works. 5. 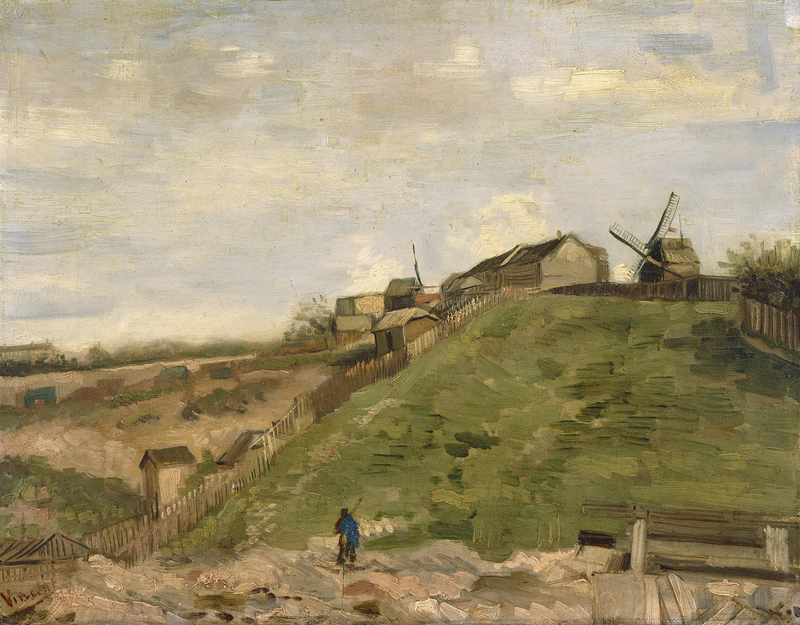 Montmartre: Windmills and Allotments. 1887. Oil on canvas. Van Gogh Museum, Amsterdam. 6. The Sower. June 1888. Oil on canvas. Kröller-Müller Museum, Otterlo, Netherlands. landscapes and several studies of bird life and insects, but also still lifes (although none of the famous sunflower or iris works), pictures of parks, gardens and farm lands, as well as buildings in rural settings. In most of the pieces humans are part of the landscape. In one, van Gogh’s homage to Millet (#6) the figure not only occupies central place, he is in fact the “subject” of the work, although a distant one. 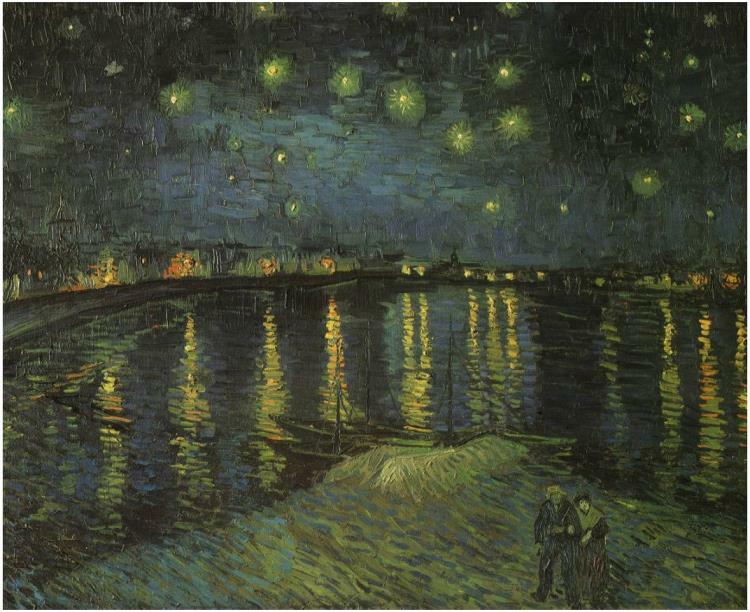 The show did not include the night skyscapes, and the selection principles excluded the formal portraits, including the self-portraits, which in retrospect are the major direct pictorial depiction of van Gogh’s inner life. 7. Winter Garden. 1883. Ink on paper. Van Gogh Museum, Amsterdam. 8. Winter Garden. 1884. Pencil and ink on paper. Van Gogh Museum, Amsterdam. The work is not part of the Clark show. Chief among the doctrines of this school “was that God had revealed himself in all of creation and supremely in Jesus Christ so that humankind may be conformed to his image.”‡ Our natural surroundings were an important clue to the creator and our purpose. It would be difficult enough to judge one’s life against the model of Jesus of the Gospels, but the van Goghs were something of an island. The Groningen movement was a faction within the Dutch Reformed Church (one that rejected much of the dogma of the church), and the Dutch Reformed Church itself was a minority among the Catholics of the Brabant province of southern Netherlands where the van Goghs lived. And as evangelists, they were expected to spread the faith. All of this could be calculated to impose a burdensome responsibility on a sensitive youth, and Vincent was uncommonly sensitive. 9. The Parsonage Garden in the Snow. 1884-85. Oil on canvas. Hammer Museum, Los Angeles. 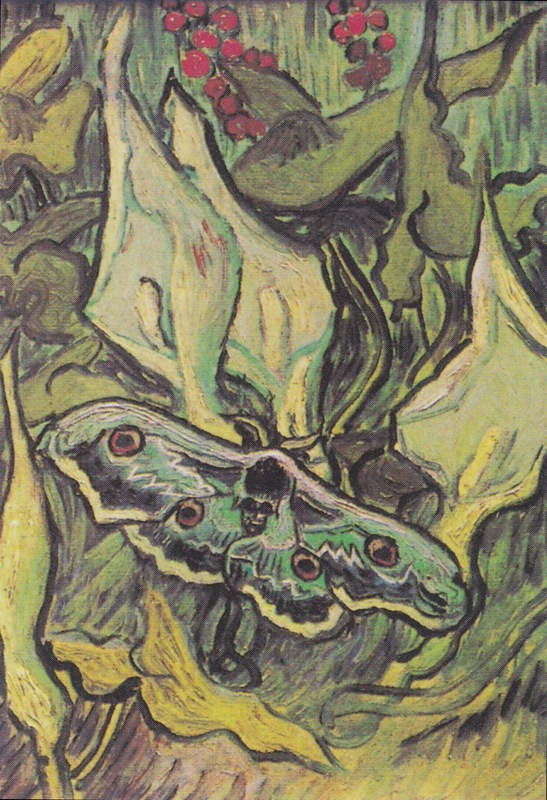 Whatever combination of disorders, syndromes, awkwardness and social maladjustments van Gogh experienced as a child (his sister-in-law later described him as “of a difficult temper, often troublesome and self-willed”), his mind proved a fertile plot for the seeds of this theology which would later flower in grotesquely exaggerated conduct. Pietism and asceticism seemed to grow rapidly when he was away from home. In England in his early twenties he discovered Bunyan’s Pilgrim’s Progress, which became a central metaphor for him, and he warmly recommended it to his brother (to Theo, November 25, 1876). In his first stay in London he also discovered George Henry Boughton, whose Pilgrims Going to Church, which he admired and led him to the pilgrim poems of Henry Wadsworth Longfellow, The Courtship of Miles Standish and Evangeline, which he considered “beautiful” (to Theo, July 20, 1773; to Willem and Caroline van Stockum-Haanebeek, sometime around October 16-31. 1873). His identification with English sectarian dissenters became his defense against worldly commerce: When he was later installed as a clerk in a bookstore in Dordrecht, he dressed in Quaker garb and affected asceticism. That position lasted only a few months, and from thence he was able to launch his desired career as a pastor-missionary. 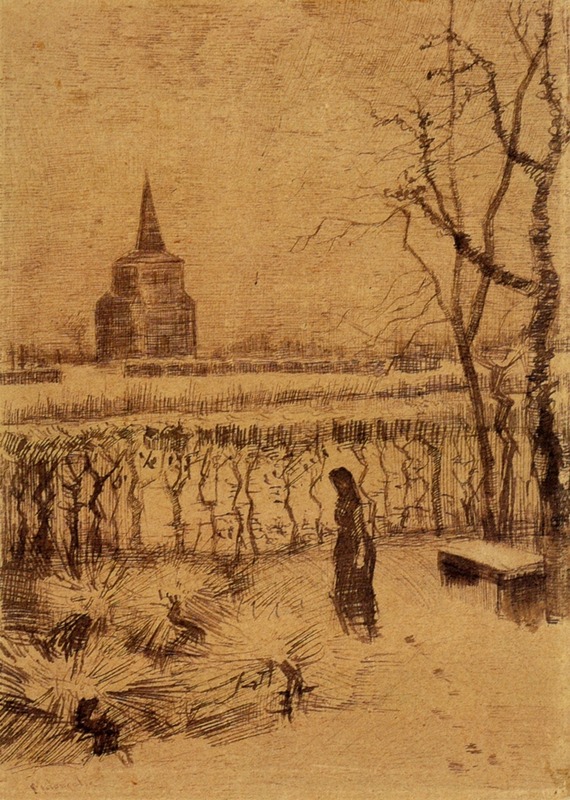 This embarrassing, failed and ultimately degrading detour in van Gogh’s career, famous enough that it need not be picked over again, is noteworthy here, mainly for the first sermon he gave on October 29, 1876, in which he expands on his pilgrimage metaphor, relates it to a painting and reveals other aspects of his personality, such as alienation, grim determination, a mystical view of life, and other features that help explain his art. Even those casually interested in van Gogh ought to read it. It goes a long way to explain why the people in his landscapes are traveling or toiling. 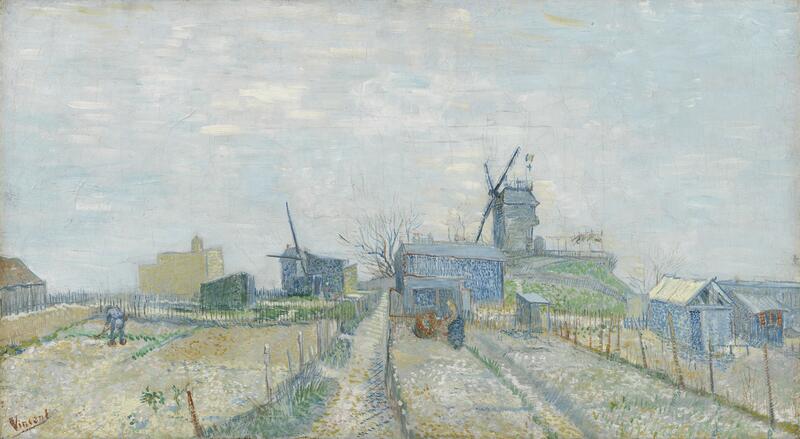 Vincent thought so highly of the sentiments that he sent it to his brother (to Theo, November 3, 1876). 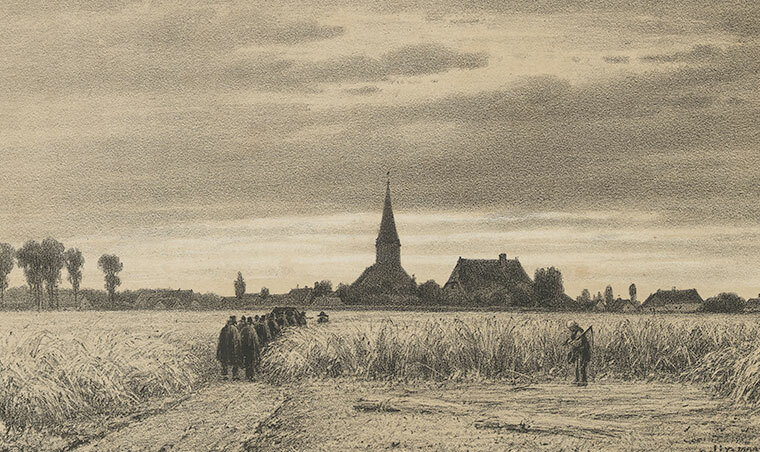 Going to Church for the Last Time (The Funeral in the Cornfield) by Jacob Jan van der Maaten. 1862. Lithograph. Van Gogh Museum, Amsterdam. “Heard the Rev. Laurillard on Sunday morning in the early sermon on ‘Jesus went through the cornfields’. He made a deep impression on me–he also spoke in that sermon about the parable of the sower and about the man who cast seed into the ground, and he should sleep, and rise day and night, and the seed should spring and increase and grow up, he knoweth not how, he also spoke about the funeral in the cornfield by Van der Maaten. The sun shone through the windows—there weren’t that many people in the church, mostly labourers and women” (to Theo, June 12, 1877). 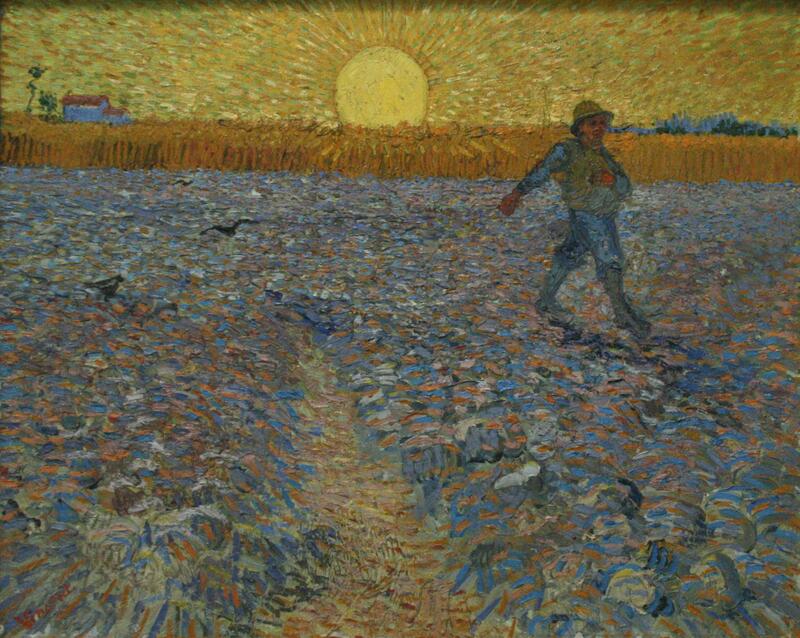 Van Gogh’s Christianity was not simply contemplative; it drove van Gogh to minister to miners in the Borinage in Belgium because of the social conscience it instilled in him. His sense of empathy drove him to live in abject poverty, an eccentricity which led them to reject him as their minister. 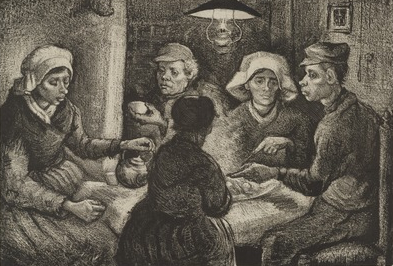 Despite the snub, van Gogh never lost his empathy for the poor. 10. Giant Peacock Moth. 1889. Chalk and ink on paper. Van Gogh Museum, Amsterdam. “Now for idea and sentiment it’s perhaps the last one that I prefer: ‘For hope has poured its neurosis into my breast,’ but it seems to me that what you want to evoke isn’t stated clearly enough: the certainty that we seem to have and which anyway we can prove, of nothingness, of emptiness, of the treachery of desirable, good or beautiful things, and despite this knowledge we forever allow ourselves to be deceived by the spell that external life, things outside ourselves, cast over our 6 senses, as though we knew nothing, and especially not the difference between objective and subjective. And fortunately for us, in that way we remain ignorant and hopeful” (to Émile Bernard, April 19, 1888). 11. Pine Trees at Sunset. December 1889. Oil on canvas. Kröller-Müller Museum, Otterlo, Netherlands. “I’m astonished that with the modern ideas I have, I being such an ardent admirer of Zola, of De Goncourt and of artistic things which I feel so much, I have crises like a superstitious person would have, and that mixed-up, atrocious religious ideas come to me such as I never had in my head in the north” (to Theo, September 20, 1889). For van Gogh, life would remain a struggle, a pilgrimage, not, however, “to the very end,” as the Angel of God said in his sermon, but until he could no longer force himself to go on. Detail of Man Digging and a Landscape with Cypresses. February-March 1890. Pencil on paper. Van Gogh Museum, Amsterdam. Not included in Clark show. “It’s precisely because I have a draughtsman’s fist that I can’t keep myself from drawing and, I ask you, have I ever doubted or hesitated or wavered since the day I began to draw? I think you know very well that I’ve hacked my way through and am obviously ever more keen to do battle” (to Theo, April 23, 1882). Men Digging. April-May 1882. Pencil on paper. Enclosed in letter to Theo van Gogh, ca. April 23, 1882. Not included in Clark show. Beginning fairly late in life (at 28) and without ever receiving much formal training, van Gogh throughout his short career struggled, especially, with the human figure. Not only are body parts out of proportion with each other, figures are often out of proportion with their surroundings (e.g., #5). His letters to Theo frequently enclose sketches of landscapes and buildings (where proper proportions are observed) (e.g., to Theo, May 31, 1876; to Theo, November 25, 1876; to Theo, ca. November 13, 1878). By contrast the sketches of people he sends to Theo look awkward, mechanical and stilted (e.g., to Theo, August 20, 1880; to Theo, January 1881; to Theo, September 1881; to Theo, April 6, 1882). Van Gogh’s draftsmanship, particularly of immoveable, large objects, improved once van Gogh obtained a perspective frame (thanks to a sum from his brother beyond the monthly stipend that supported the artist) (to Theo, August 5 and August 6, 1882). 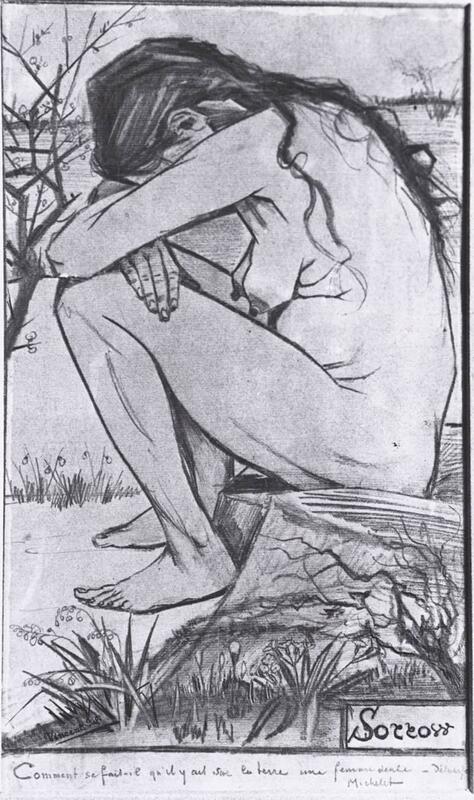 But this and other drafting equipment could not help with the drawing of the human figure, which requires detailed anatomy study, careful observation and above all models, an almost impossible expense for van Gogh, at least if van Gogh confined himself to respectable, bourgeois models as his instructors wanted. Sorrow. April 1882. Pencil and ink on paper. The New Art Gallery Walsall, England. The caption is a quotation from Michelet, translated as: “How can there be on earth a woman alone, deserted?” Not included in Clark show. Van Gogh thought he hit on a solution to this by hiring models from the proletariat and living among them. This also finessed the problem that van Gogh’s antisocial behavior, ragged dress and crude impulsiveness made working with “proper” models impossible. It was by this way of employing models that van Gogh hired the prostitute Sien Hoornik, and through a combination of pity, loneliness and his own peculiar sentimentalism, he took her and her daughter in and later also supported her baby when she delivered. The scandal that ensued caused a break with his father and the termination of the lessons given to him by his idol (and second cousin), Anton Mauve. The story is told between the lines of his letter to Theo ca. May 7, 1882. (Van Gogh’s sister Lies has a different, and less plausible, explanation. **) The violation of bourgeois decorum was probably as much at the heart of the matter as the sin. (“You have a vicious character!” Mauve told van Gogh.) The breach deeply affected Vincent. 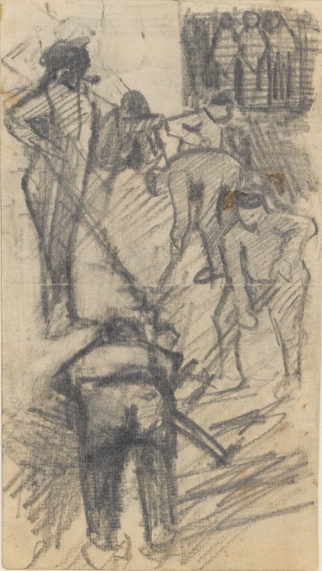 But rather than discourage him (even though Hague Goupil dealer Tersteeg used the occasion to remind van Gogh that he had failed at everything he tried—school, commerce, the clergy—in his three decades of life), van Gogh promised his brother that he would persevere and even used his sketch of Men Digging (above right) as evidence that he was improving. Roots or Study of a Tree. April 1882. Pencil, chalk, ink, watercolor. Kröller-Müller Museum. Not included in Clark show. The fact of the matter, however, was that van Gogh was never going to attain the kind of romantic verisimilitude that Mauve perfected, such as in his Shepherdess with a Flock of Sheep, at the Rijksmuseum. Van Gogh was not attempting to portray something that could be seen, he was attempting to show what the thing meant. 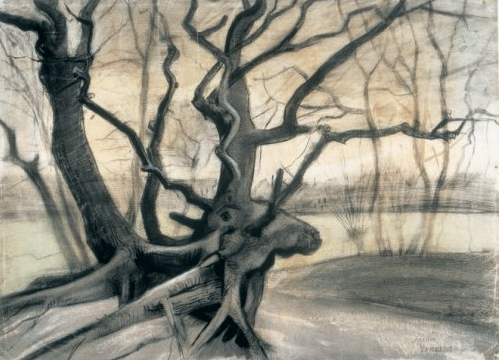 He described the approach to his brother in connection with two drawings: One of Sien, sitting in despair, titled Sorrow; the other a study of aerial roots in sandy soil, called Roots or Study of a Tree. 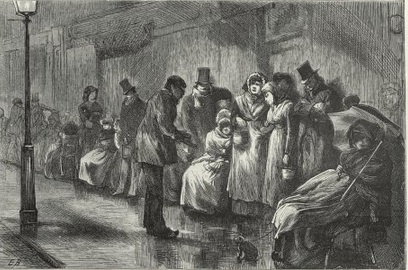 People Waiting for Ration Tickets in Paris by Edwin Buckman. From The Graphic, November 19, 1870. Van Gogh referred to the print as In front of the shelter and seems to have gotten a reprint in an 1882 magazine (see to Theo, ca. October 24-27, 1882). Not included in Clark show. Sorrow represents both a culmination and a path-not-taken for van Gogh. By far his most successful drawing, it was masterfully composed and executed. 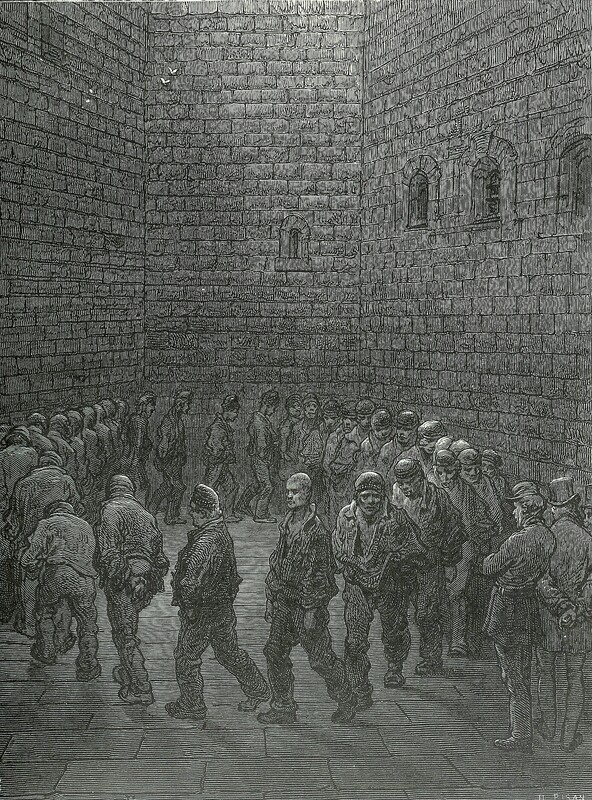 As for the subject matter, the work exudes the pathos that guided van Gogh’s life, revealed not only in his ministration to the coal miners in the Borinage (undertaken with abject humility) but also in his collection of prints, which included Buckman’s People Waiting for Ration Tickets in Paris (see to Theo, ca. October 24-27, 1882), Fildes’s Homeless and Hungry (see to Theo, January 9, 1882), Doré’s Exercise Yard at Newgate Goal (see to Theo, February 12, 1890), among others. Van Gogh’s own drawings, however, were so outside the English-French tradition (it was more German than anything else) that he could hardly have been encouraged to continue (and perhaps even learn engraving or etching). If he did, however, he might have pioneered the kind of socially-informed expressionism that Käthe Kollwitz turned into a powerful weapon. But Kollwitz grew up inside a radical tradition, whereas van Gogh’s compassion arose from his bourgeois liberal Christian roots and withered when he hacked off the limbs of that faith. “I’ve tried to imbue the landscape with the same sentiment as the figure. “Frantically and fervently rooting itself, as it were, in the earth, and yet being half torn up by the storm. I wanted to express something of life’s struggle, both in that white, slender female figure and in those gnarled black roots with their knots. Or rather, because I tried without any philosophizing to be true to nature, which I had before me, something of that great struggle has come into both of them almost inadvertently. At least it seemed to me that there was some sentiment in it, though I may be mistaken, anyway, you’ll have to see for yourself” (to Theo, May 1, 1882). 12. Birds’ Nests. Late September-early October 1885. Oil on canvas. Kröller-Müller Museum, Otterlo. “You know what I’m seeking, the barest essentials, but anything more rather leaves me cold. What I’d like to have is a weekly wage like any other labourer, for which I’d work with all my might and powers of reason. And being a labourer, I belong to the working class and shall live and put down roots in that sphere more and more. I can’t do anything else and I have no desire to do anything else, I can’t imagine anything else” (to Theo, May 10, 1882). 13. Vase with Honesty. 1884-85. Oil on canvas. Van Gogh Museum, Amsterdam. “Yesterday evening I was occupied with an area of woodland with a slight upward slope covered in rotting and dead beech leaves. The ground was lighter and darker red-brown, all the more so because of the cast shadows of trees that threw bands across, weaker or stronger, half blotted out. The problem, and I found it to be most difficult, was to get the depth of colour — the enormous strength and fixity of that area—and yet it was only while painting that I noticed how much light there still was in that darkness. To keep it light and yet keep the glow, the depth of that rich colour, for there’s no carpet imaginable as splendid as that deep brown-red in the glow of an autumnal evening sun, although tempered by the wood” (to Theo, September 3, 1882). Van Gogh would spend three more years in the Dutch provinces.†† During that time van Gogh thought deeply about both color and composition. His letters to Theo are filled with descriptions of his ventures into heaths and deciduous forests with the kind of detail that one expects from academic art critics. Oils presented a challenge to van Gogh, and he responded with meticulous attention to the appearance and physical characteristics of the paint. He even experimented with modeling oils squeezed directly onto the canvas (see Letter to Theo, September 3, 1882. 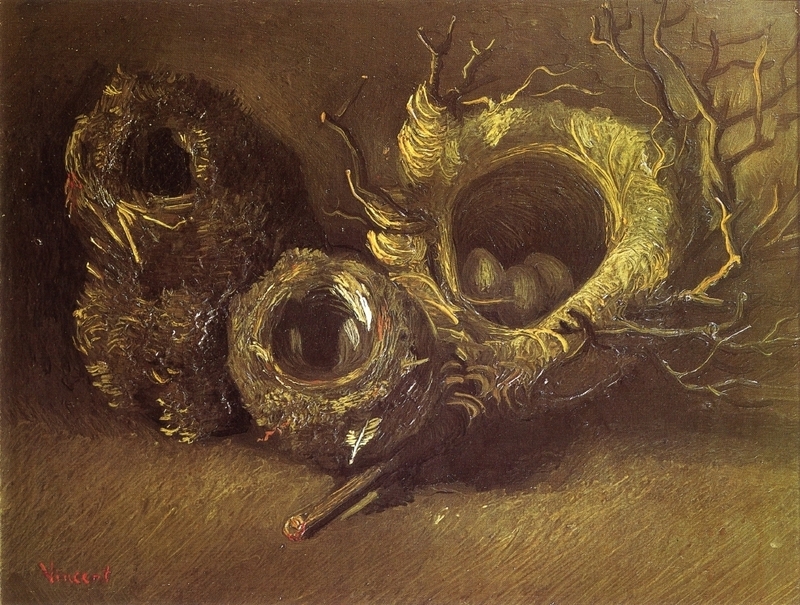 His 1885 study Bird’s Nests (#12, above), also shows evidence of experiments in “molded” oils, direct from the tube. 14. The Swamp. 1881. Ink and pencil on paper. Virginia Museum of Fine Art, Richmond. 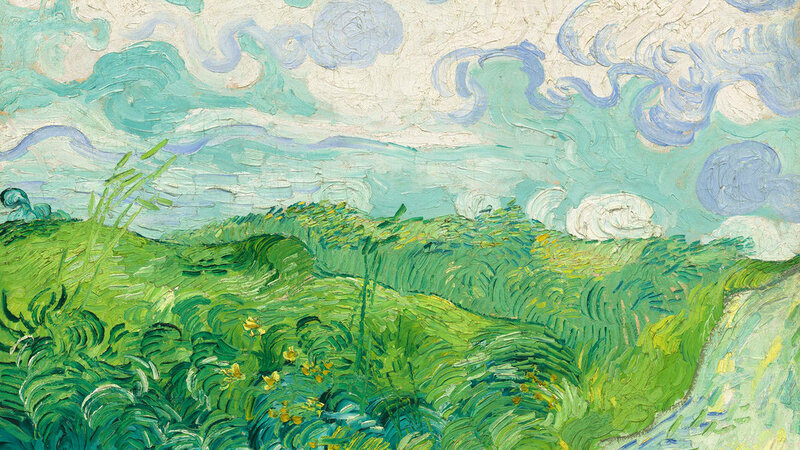 Van Gogh seemed to have done most of his experimental self-teaching with landscape. 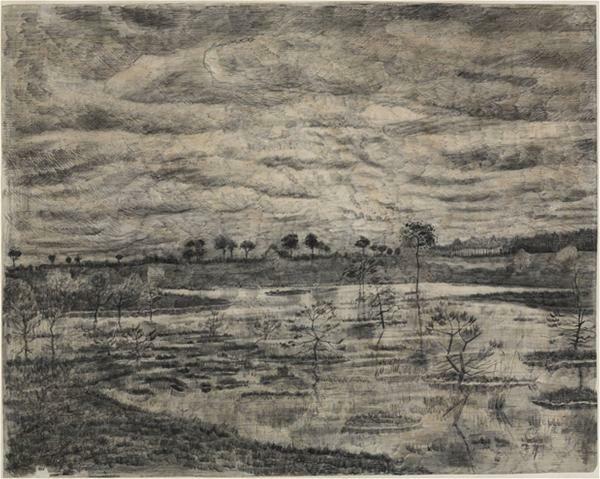 The Clark show had two drawings of marshlands from his time in Etten in Brabant (##4 & 14). Both have natural water life in the foreground with signs of village life only on the far horizons. 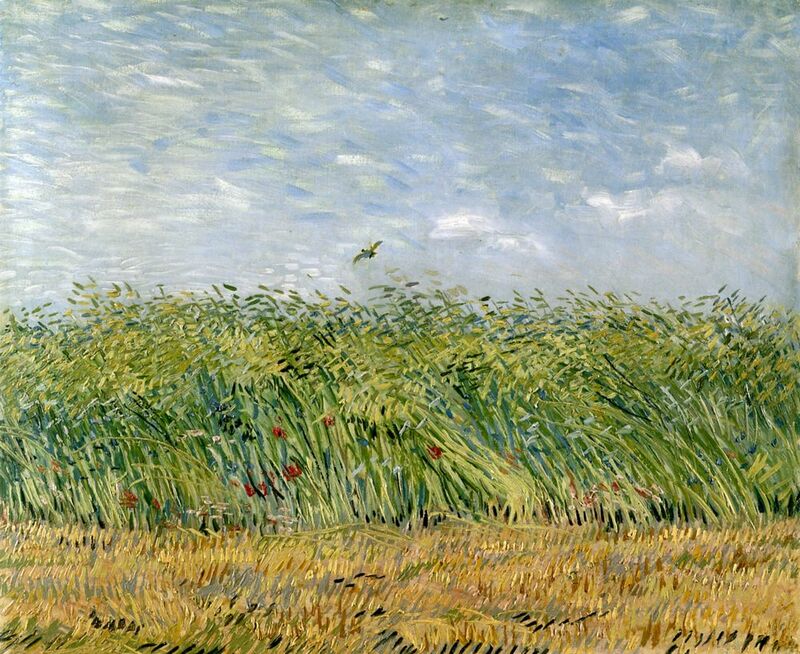 Both show that van Gogh took meticulous care to render the plant and bird life true to nature. Two drawings at the exhibition from van Gogh’s return from Antwerp, painted in Drenthe (although at the other end of the Netherlands, the area was considered by van Gogh to resemble the Brabant countryside) (##7 & 8). These two later drawings depict gardens in town, rather than wild lands far away. People work and move among the natural objects. But what is more striking is that the tree branches, stripped bare in winter time, seem formed to express a mood, perhaps the gloominess when natural life is reduced to its barren minimum. 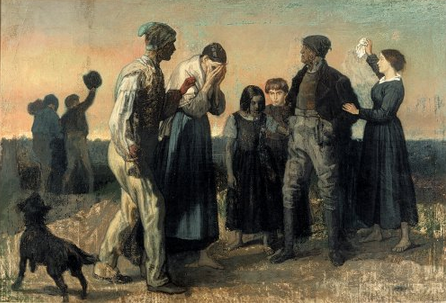 Le départ du conscrit (“The Conscript’s Departure”) by Charles Camille Auguste De Groux. ca. 1869 or 1870. Oil on canvas. Musées royaux des Beaux-Arts de Belgique, Brussels. Not included in Clark show. Van Gogh’s initial breakthroughs in color experiments, begun just before he left The Hague, also are part of this movement towards something like proto-expressionism in van Gogh’s view. 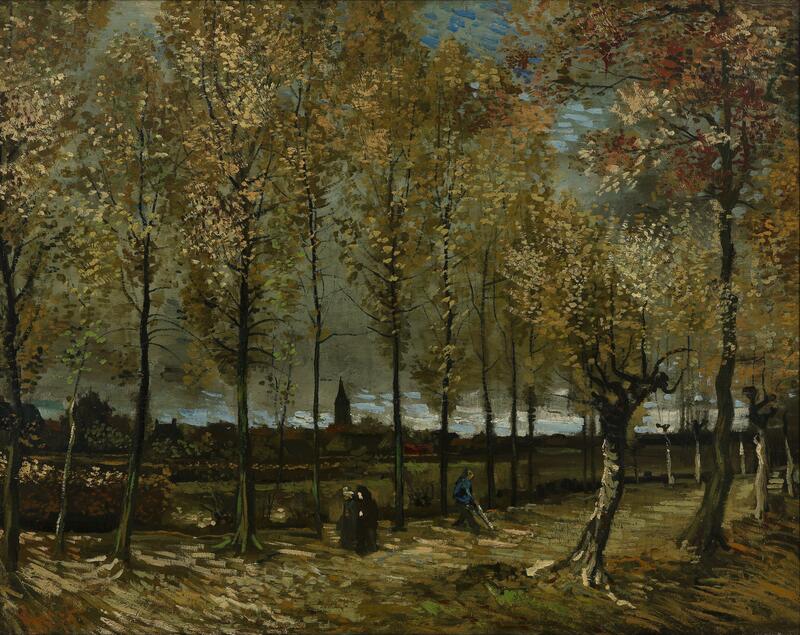 The description to Theo in his September 3, 1882 letter (quoted above) of leaf mold and composted forest litter evoked in van Gogh a mood, one which he tells his brother is the same as that evoked by the Belgian artist Charles De Groux in his painting The Conscript’s Departure. Clearly van Gogh was saying that nature expressed anthropomorphic feelings in an artist’s hands. Van Gogh could feel, and wanted to express, the heart-break and tenderness in Nature. 15. Poplars near Nuenen, 1885. Oil on canvas. Museum Boijmans Van Beunigen, Rotterdam. 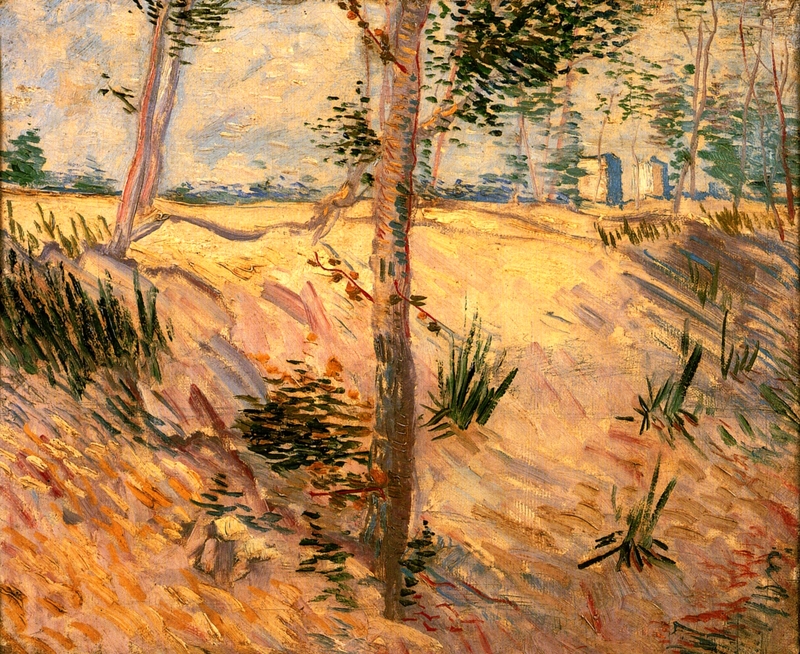 And yet while landscapes were taking up most of his thinking about technique and expression, van Gogh still believed “the figure must remain the chief concern” (to Theo, July 28, 1882). 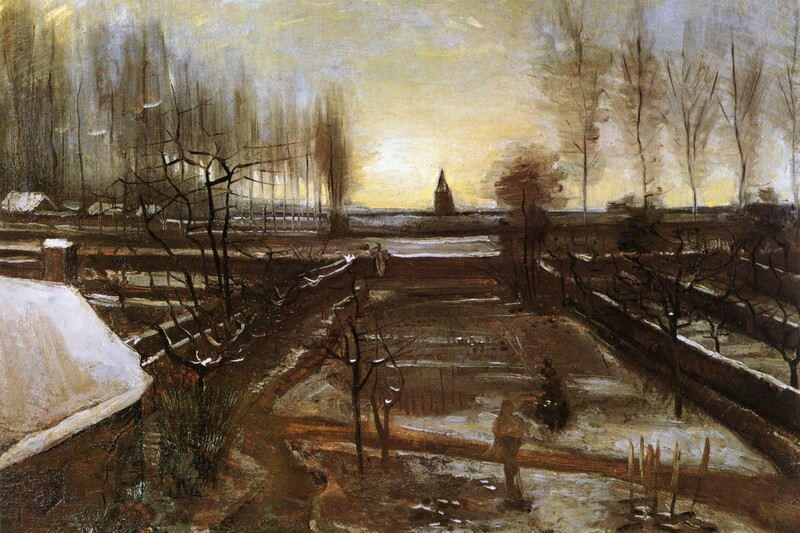 He struggled on at The Hague with figure drawing, even though he believed application to landscapes might produce saleable works (to Theo, February 13, 1882). When he returned to the Brabant to live with his parents in 1883 he began studies of local peasants and craftsmen. 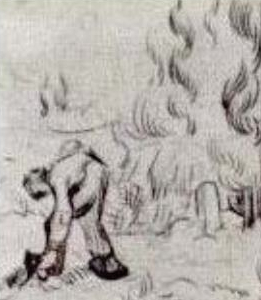 He managed to alienate these objects of his pity, just as he did the miners in the Borinage, but before he did he was able to create a figure composition which he believed expressed his understanding of their lot. Before painting the picture he sent a lithograph of The Potato Eaters to his brother as well as to fellow artist and friend Anthony van Rappard. Van Rappard’s evaluation was scathing (from van Rappard, May 24, 1885): “I myself was shocked by it,” wrote van Rappard, offering that “such work isn’t intended seriously.” He criticized van Gogh’s lack of conception of how figures move. He attacked the poses: the “coquettish little hand of that woman at the back” and the lack of connection between “the coffeepot, the table and the hand lying on top of the handle.” Most brutally he asks if the man on the right is missing “a knee or a belly or lungs? Or are they in his back? And why must his arm be a metre too short? And why must he lack half of his nose?” His conclusion cut deeply into van Gogh’s pretension as an artist: “Art is too important, it seems to me, to be treated so cavalierly,” he lectured van Gogh. The Potato Eaters. April 1885. Lithograph. Museum of Modern Art, New York City. Van Gogh responded defensively, claiming that modern art was more than technique (to Anton van Rappard, July 13, 1885), but the exchange damaged their friendship. Still van Gogh must have realized the justice of the remarks, inasmuch as he painted the final work in oil in a way to meet each of the criticisms. And he attempted no major painting on figures again, until a month before his death (and that was almost a portrait, its situation outside merely provided background). Figures would remain supporting characters in his landscapes. It was as though he had more understanding of natural landscapes than people in action. It seemed he needed to see people acting naturally through other artists’ eyes, and the works focusing on figures in action are more homages to other artists than original compositions (e.g., #6, after Millet; Raising of Lazarus, after Rembrandt; and Pietà, after Delacroix; even Young Girl in White was an homage to Puvis de Chavannes). Whatever its representation defects, The Potato Eaters also seems to me to fail in its purpose. It neither evokes empathy for the peasants nor shows their nobility. Both of these qualities were far better evoked in the landscape of a peasant’s house which he painted two years before (#16). 16. 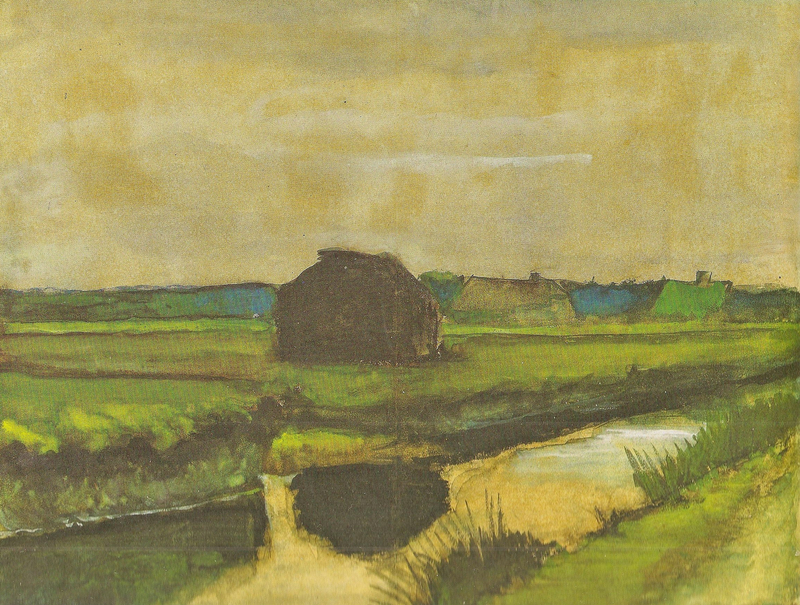 Landscape with a Stack of Peat and Farmhouses. 1883. Watercolor on paper. Van Gogh Museum, Amsterdam. 17. Sheaves of Wheat. July-August 1885. Oil on Canvas. Kröller-Müller Museum, Otterlo, The Netherlands. What makes this watercolor so evocative is the subtle coloring of the sky and river which are made up of several shades of yellow, reddish-brown and blue, something that the illustration above does not capture adequately. Van Gogh’s ability to combine and mix watercolors in the way he was doing with oil is another example of his meticulous self-education through experiment, something he was able to do with color, but unable to do with the human form. It was for this reason he spent three months in Antwerp for instruction, before moving to Paris. 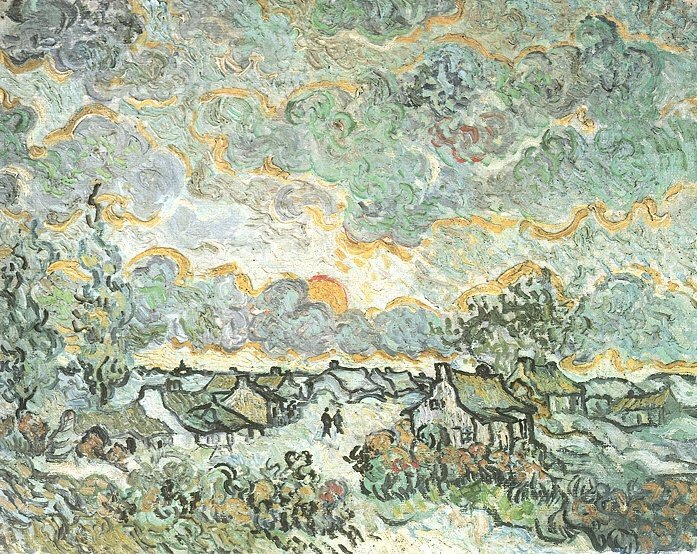 Until then Van Gogh responded to van Rappard’s criticisms by returning to landscapes exclusively. 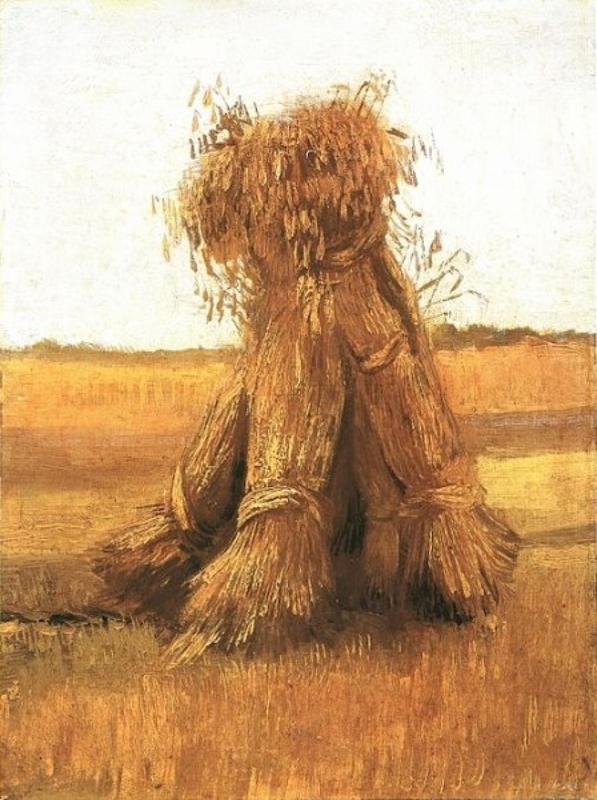 Sheaves of Wheat (#17), painted in the summer of 1885 when he returned to Brabant, completely lacks any figures. In fact the stacked sheaves seem to be a stand in for a figure in the work. The painting itself uses much brighter colors than he used in Drenthe. The lightening of his palette would continue in Paris and reach spectacular results when he left Paris for the south of France. 18. Tulip Fields at Sassenheim by Claude Monet. 1886. Oil on canvas. Clark Art Institute, Williamstown, Massachusetts. Van Gogh arrived in Paris to live with his brother March 1885. His goal was to continue his studies, the Academy in Antwerp having decided that van Gogh was insufficiently talented to continue. 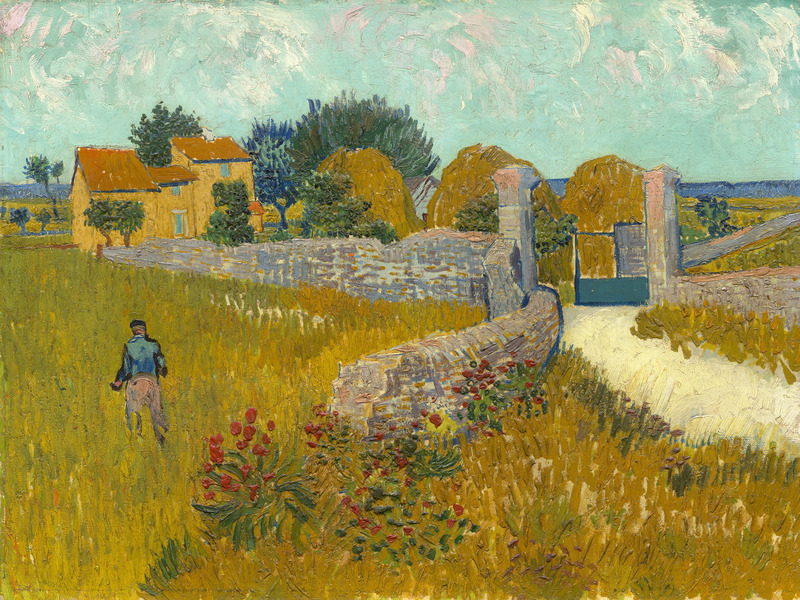 Given that the two years in Paris separates his largely somber-toned works made up of related dark colors from the bright, light-filled paintings of often clashing colors which characterize his work in southern France, a justifiable hypothesis would be that van Gogh changed in response to his first serious encounter with the Impressionists. 19. The Hill of Montmartre with Stone Quarry. 1886. Oil on canvas. Van Gogh Museum, Amsterdam. 20. Trees in a Field on a Sunny Day. Oil on Canvas. 1887. P. & N. de Boer Foundation, Amsterdam. “I sometimes regret that I can’t decide to work more at home and from the imagination. Certainly — imagination is a capacity that must be developed, and only that enables us to create a more exalting and consoling nature than what just a glance at reality (which we perceive changing, passing quickly like lightning) allows us to perceive. “A starry sky, for example, well—it’s a thing that I’d like to try to do, just as in the daytime I’ll try to paint a green meadow studded with dandelions” (to Émile Bernard, April 12, 1888). Either because he was not much impressed by them, was slow to understand the implications of their experiments or already was set on pursuing his own course (and the last seems the most likely), van Gogh’s work in Paris showed very little influence of the Impressionists, especially at the beginning. 21. Terrace in the Luxembourg Gardens. 1886. Oil on canvas. Clark Art Institute, Williamstown, Massachusetts. 22. Undergrowth. 1887. Oil on canvas. Centraal Museum, Utrecht. 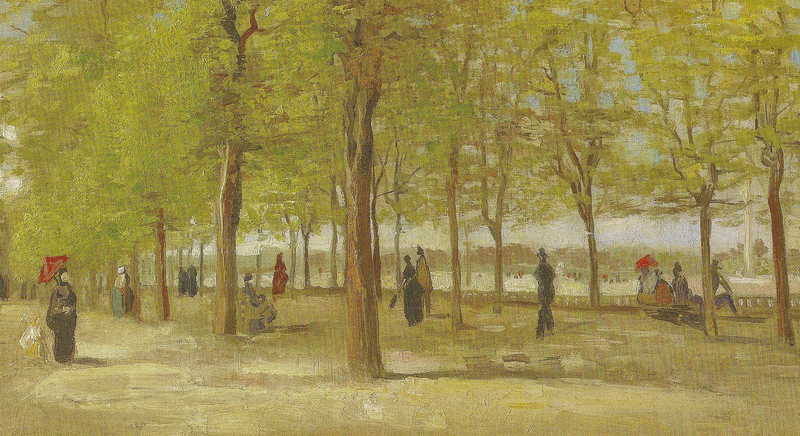 His landscape of the Luxembourg Gardens (#21), undertaken around the time he viewed the Impressionist shows, is not substantially different from a landscape in Nuenen a year before (#15). The earlier one is darker mainly owing to the time of day depicted. The treatment of the trees in both is nearly identical. 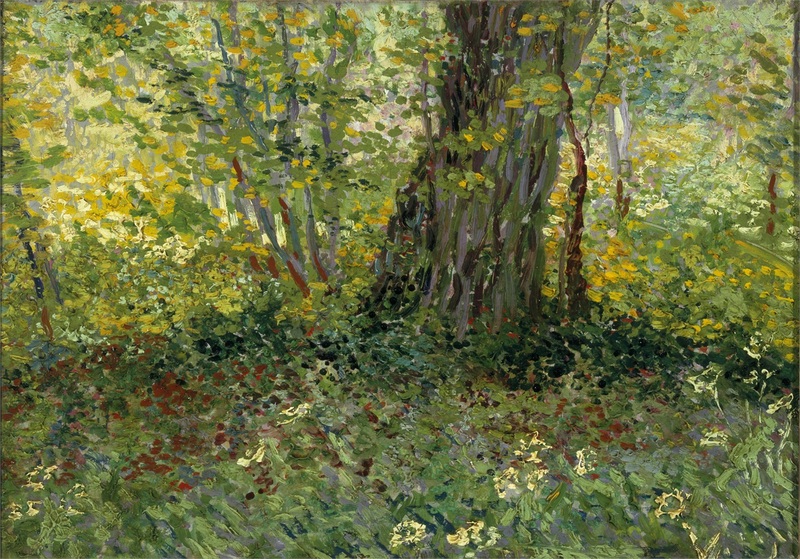 The later work shows none of the brushwork techniques of Impressionists (notably the short strokes), nor uses any Impressionist treatment of light or movement. Perhaps the only influence of the Paris avant-garde was in the stylization of the figures, which are rendered long and thin, something like the figures in Seurat’s A Sunday Afternoon on the Island of La Grande Jatte). For the next year van Gogh would continue painting landscapes the same way (see, e.g., Wheat Field with a Lark completed in the summer of 1887), whether of suburbs (##5 and 19) or of parks (##20 & 21). He even continued his interest in the undergrowth around tree trunks (#22). Vase of Flowers by Adolphe Monticelli. ca. 1875. Oil on canvas. Van Gogh Museum, Amsterdam. Not included in Clark show. (see, e.g., to Theo, ca. July 1, 1888). Monticelli himself had briefly dabbled in Impressionist experimentation but, like van Gogh, was repelled by the physicality of the emphasis at the expense of inspiration. 23. 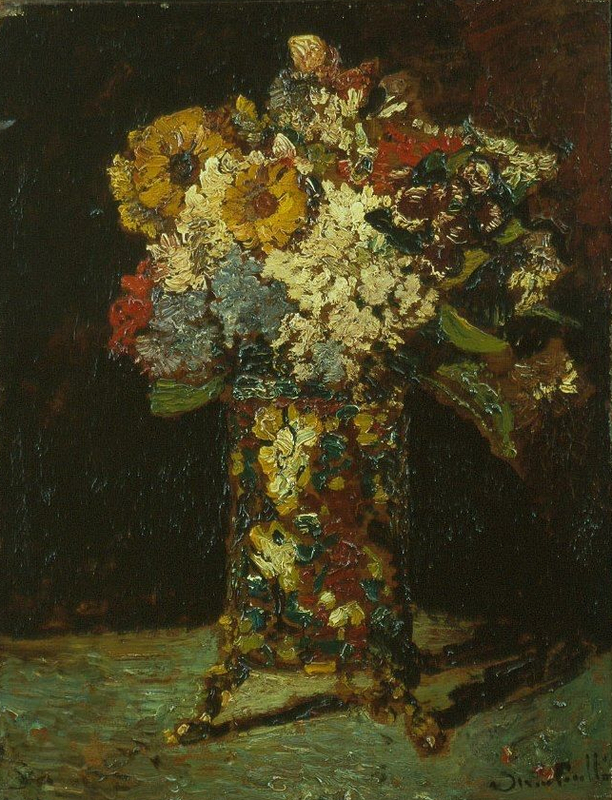 Still Life with Bouquet of Daisies. 1886. Oil on canvas. Philadelphia Museum of Art. 24. Still Life with Carnations and Other Flowers 1886. Oil on Canvas. The Kreeger Museum, Washington, D.C.
Van Gogh wrote extensively about Monticelli in his letters. In Paris he embarked on a series of still lifes with floral arrangements as part of the study of color he had been undertaking since his last stay in Brabant. These works show a progression from muted harmonious colors, punctuated by occasional bright flowers against a neutral background (#23) to one with a boldly colored vase and brightly colored flowers against bright background of several different colors (#24), to an arrangement with a metallic base on a boldly brushed table with an arrangement of a single type of flower against a boldly expressed, background wall painted with dashes and dots to break up the solid ground by flecking a bright colors against a deep green (#25). The Paris still lifes show a marked advance and confidence in the use of colors, compared, for example, with his still life with honesty (Lunaria annua) (#13). The earlier painting, from his time in Nuenen, is largely painted with analogous colors as fitting for the autumnal mood and especially for the depiction of the plant’s seedpods. 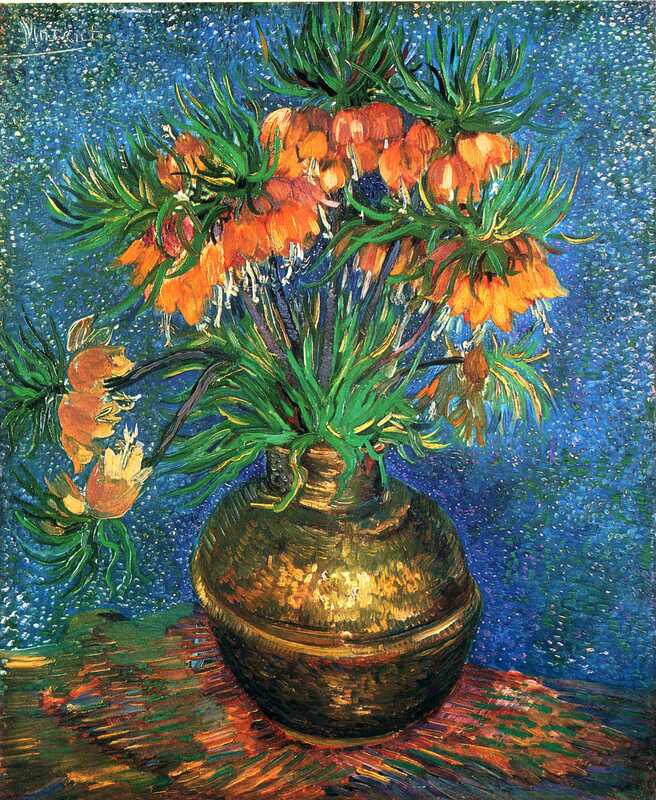 The picture of the vase of Fritillaries, by contrast, boldly uses complementary colors. 25. Impreial Crown Fritillaries in Copper Vase. 1887. Oil on canvas. Musée d’Orsay, ,Paris. 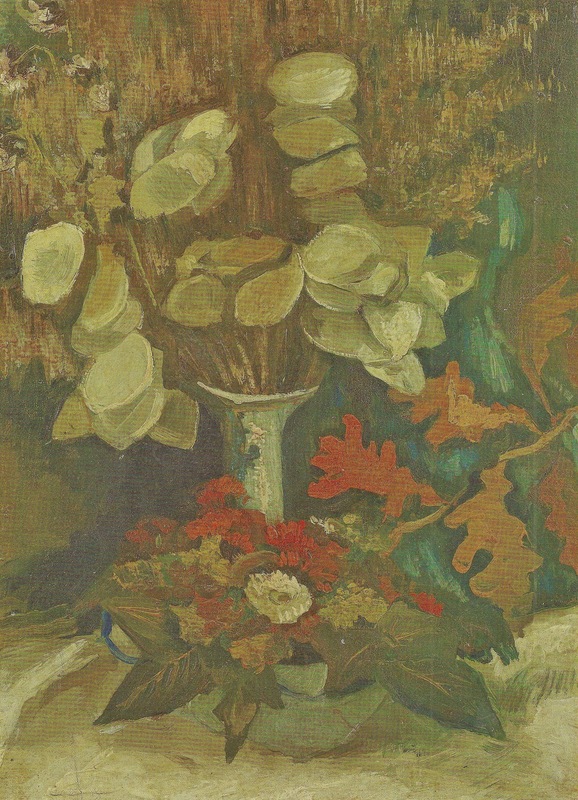 The second of the show’s three Paris still lifes of floral arrangements (van Gogh painted many others not shown at the Clark) (#24) shows a step closer to dramatic use of complementary colors with red against bluish green. Unlike the muted dark background of Monticelli’s still lifes, the carnations still life has a bright, lively background with an odd outline around the arrangement, possibly suggesting (although looking nothing like) a shadow. This outline or halo is an idiosyncrasy that will become somewhat frequent in his paintings from the south of France, especially around figures and occasionally around other objects like flowers (e.g., #28). The effect is that of a drawing and highlights the non-representational nature of the image. It is the picture of the Fritillaries arrangement (#25) that fully shows treatment of colors and his new confidence. The setting of he orange against the bluish background is the same juxtaposition of complementary colors he used in self-portraits of slightly later (see the one of September 1889, with the orange of his hair set against a blue background; or the one just before leaving Paris in January 1888 where his orange beard is contrasted with his blue frock). 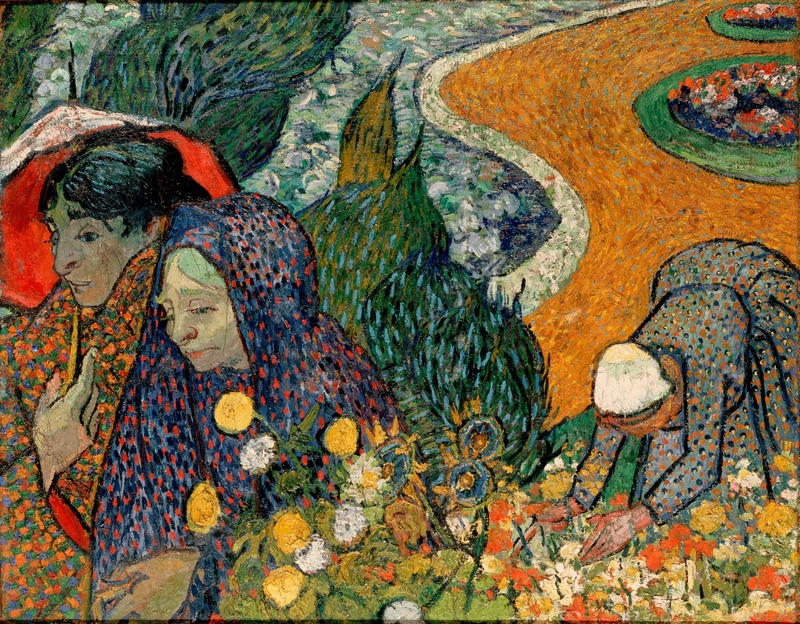 Van Gogh advised Livens that his flower paintings were designed to “seeking oppositions of blue with orange, red and green, yellow and violet, seeking THE BROKEN AND NEUTRAL TONES to harmonise brutal extremes.” The purpose was “to render intense COLOUR and not a GREY harmony” (to Horace Mann Livens, ca, September-October 1886). As he became more comfortable with color composition his brushwork also became sure. The flowers are literally swept with a stroke of paint and the leaves are made by a single stroke. 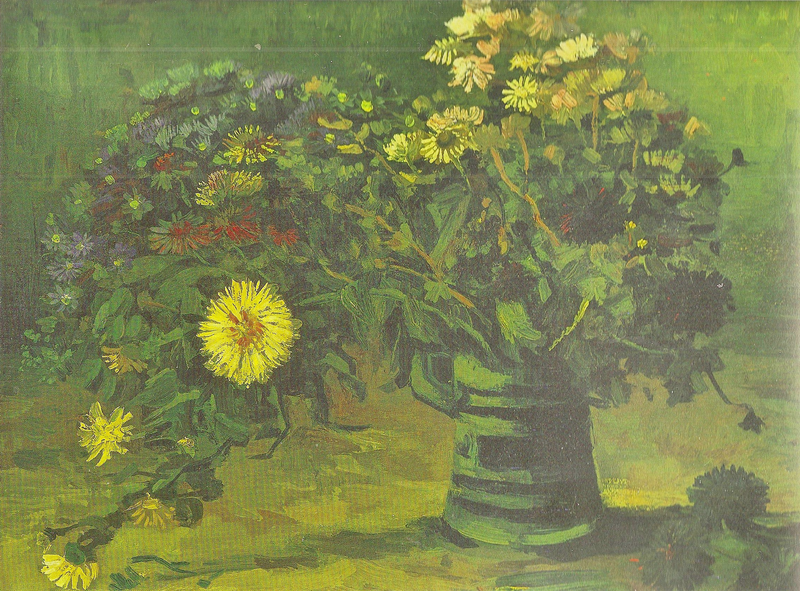 The last still life (#25) brought van Gogh’s color studies as far as he felt he could go in the city. 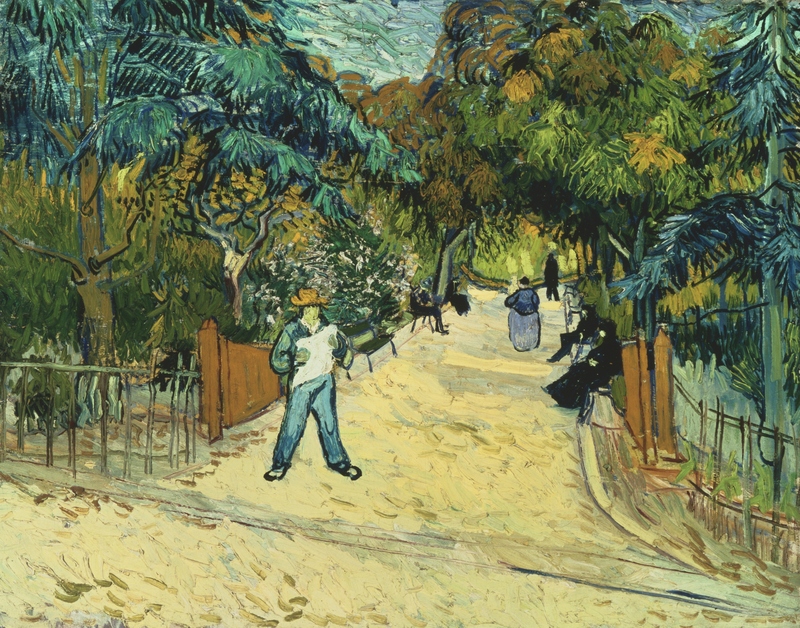 As early as his 1886 letter to Livens van Gogh revealed his plans to move south to “the land of the blue tones and gay colours.” Strain between the brothers, from Vincent’s refusal to charge for his portraits and from assorted bouts boorish behavior, made his departure inevitable but by February 1888 the time was right from Vincent’s point of view and he moved to Arles, near Marseille, where Monticelli had lived. His move to Provence marks the beginning of his last period—he would die less than two and a half years later. But it released a burst in self-expression beyond what the work-driven artist had ever done before. It was not just the number of paintings, it was their daring and revelation. Van Gogh seems to have found his center in the south of France because not only is his art an outpouring of his imagination, so are his letters, which are filled with confident discussions about art, insights into literature and self-analysis, the mystical musings of a now thoroughly materialist-minded man. 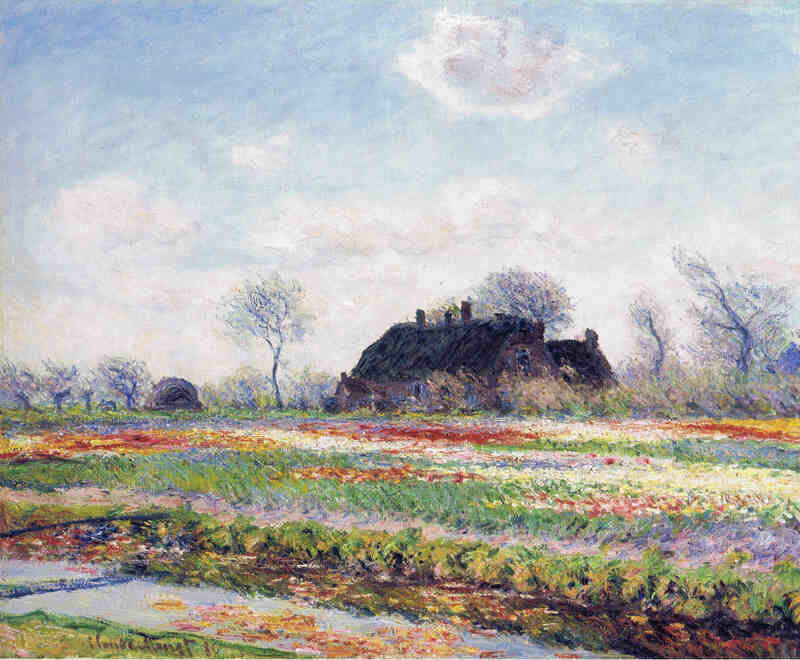 Away from Paris, he was now able to see flower gardens much as Monet did in Holland (see, e.g., Garden in Bloom completed in July 1888). He even undertook a scene of night life, one of the Impressionists’ favorite subjects (see The Café Terrace at Arles at Night). And he painted figures enjoying a city park (#26). 26. Entrance to the Public Gardens in Arles. 1888. Oil on canvas. The Phillips Collection, Washington, D.C. Entrance to the Public Gardens in Arles seems vibrantly alive because van Gogh unleashes a variety of complementary colors much more freely than he did in Paris, and certainly something he wouldn’t have done when studying color instructions books in the Dutch provinces. The vanishing point of the picture plane is high on the canvas and together with the sky seen behind the tree foliage in front cuts the trees into two sections but their branches meet forming something of a tunnel for the park-goers. The trees themselves are sub-tropical, not the kind he had painted before. The figures are heavily outlined showing that van Gogh is making no effort at visual verisimilitude. The entire scene is bursting with life, but the park goers seem oblivious to it. 27. Farmhouse in Provence. 1888. Oil on canvas. National Gallery of Art, Washington, D.C.
“Yesterday, at sunset, I was on a stony heath where very small, twisted oaks grow, in the background a ruin on the hill, and wheat fields in the valley. It was romantic, it couldn’t be more so, à la Monticelli, the sun was pouring its very yellow rays over the bushes and the ground, absolutely a shower of gold. And all the lines were beautiful, the whole scene had a charming nobility. You wouldn’t have been at all surprised to see knights and ladies suddenly appear, returning from hunting with hawks, or to hear the voice of an old Provençal troubadour. The fields seemed purple, the distances blue” (to Theo, July 5, 1888). 28. Dandelions. 1889. Kunstmuseum, Winterthur, Switzerland. “I’m struggling with a canvas begun a few days before my indisposition. A reaper, the study is all yellow, terribly thickly impasted, but the subject was beautiful and simple. I then saw in this reaper – a vague figure struggling like a devil in the full heat of the day to reach the end of his toil – I then saw the image of death in it, in this sense that humanity would be the wheat being reaped. So if you like it’s the opposite of that Sower I tried before. But in this death nothing sad, it takes place in broad daylight with a sun that floods everything with a light of fine gold” (to Theo, September 5-6, 1889). 29. Olive Trees. 1889. Oil on canvas. Scottish National Museum, Edinburgh. Behind his fields the sun keeps getting bigger. Preoccupied as he was by his own death, van Gogh became like the character in Leonid Andreyev’s “Lazarus.” who, having once been dead, obsessively chases the sun. Van Gogh fixed on other physical features which he painted over and over. Irises and sunflowers are among his most well-known visual tropes. 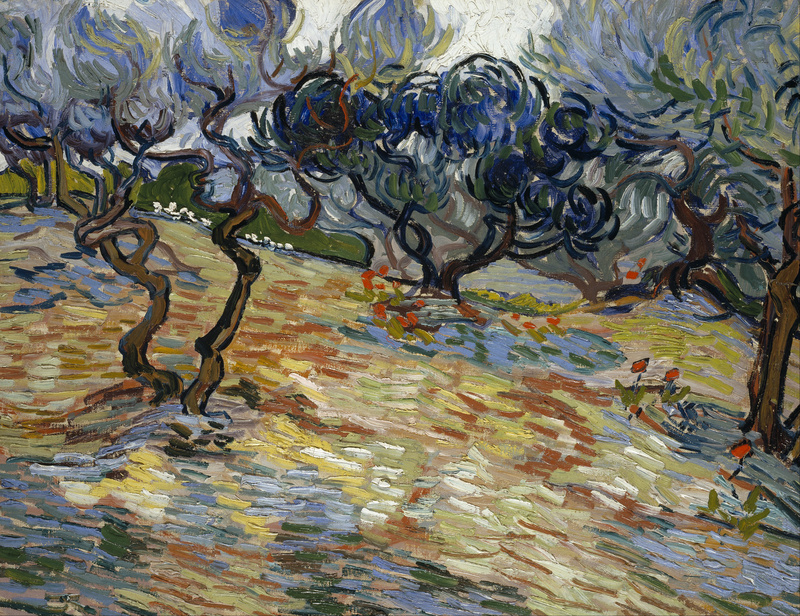 The olive tree resonated with van Gogh: “the murmur of an olive grove has something very intimate, immensely old about it”, while the oleander “speaks of love”, the olive tree is “something else, it is, if you want to compare it to something, like Delacroix” (to Theo,April 28, 1889). 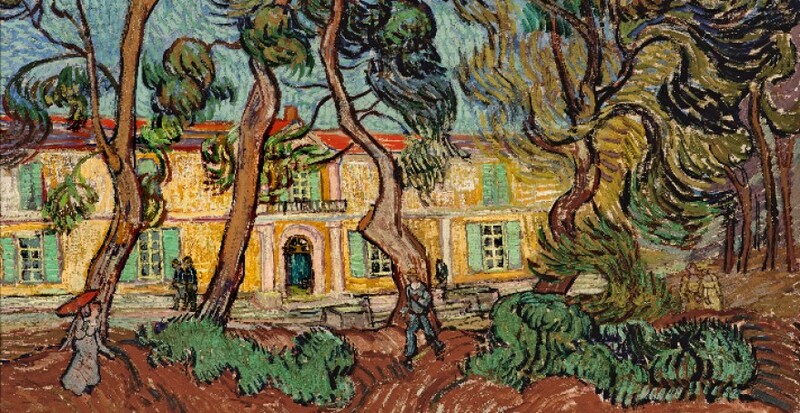 His 1889 Olive Trees also exhibited the swirling effects that he indulged in just at the time of his self-mutilation and commitment to the asylum in Saint-Rémy (see also #2). Starry Night Over the Rhone. 1888. Oil on canvas. Musée d’Orsay, Paris. Not included in the Clark show. 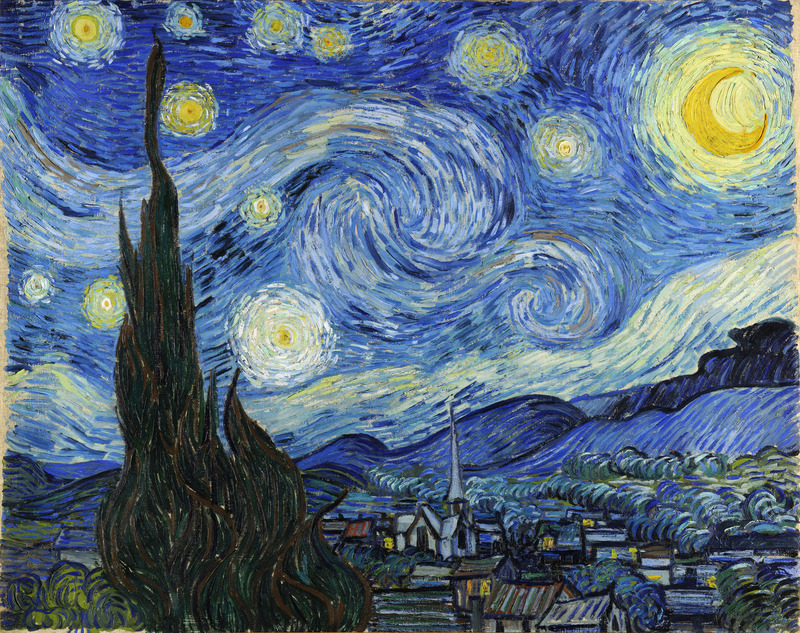 And of course his most famous visual trope is the starry night, which welled up from van Gogh’s early fascination with the color of the sky before sunrise and after sunset. At Arles he painted outdoors at night, and, alone, he allowed his mind to wander back toward his early mystical yearnings, but this time transfigured by modern materialism. In a long letter to Émile Bernard in his first summer in the south, van Gogh unburdened himself on such topics as Jesus, the artist in words, and his own alienation. The Earth was so hostile to artists, he said quoting Jean Richepin, that “love of art makes one lose real love.” What was his consolation? He speculated that an artist is like a caterpillar on earth but destined to be a butterfly elsewhere. The Starry Night. 1889. Oil on canvas. Museum of Modern Art, New York City. Not included in Clark show. After all, he continued, the earth looks flat, but science has proved it round and nobody denies that now. “Now at present, despite that, we’re still in the position of believing that life is flat and goes from birth to death. “But life too is probably round, and far superior in extent and potentialities to the single hemisphere that’s known to us at present. “Future generations—probably—will enlighten us on this subject that’s so interesting—and then science itself—could—with all due respect—reach conclusions more or less parallel to Christ’s words concerning the other half of existence” (June 26, 1888). 30. 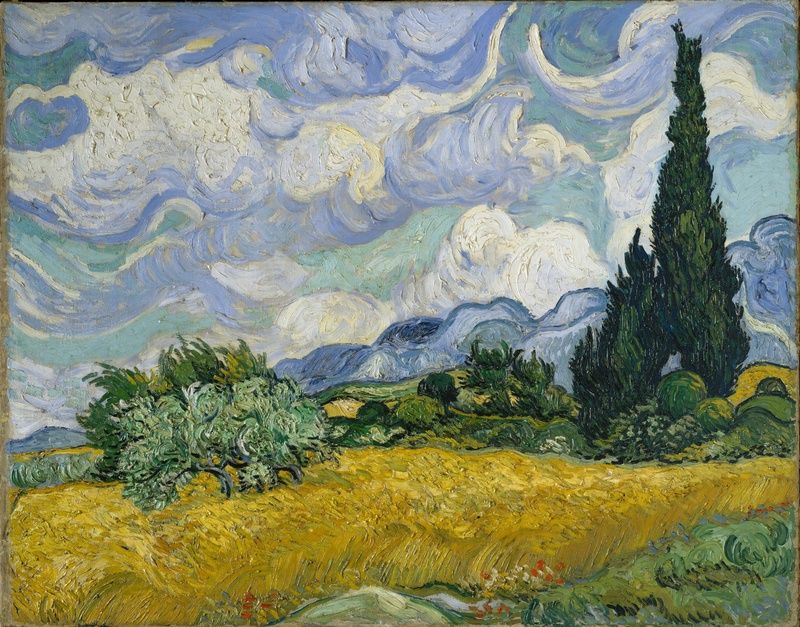 A Wheatfield with Cypresses. 1889. Oil on canvas. The National Gallery, London. 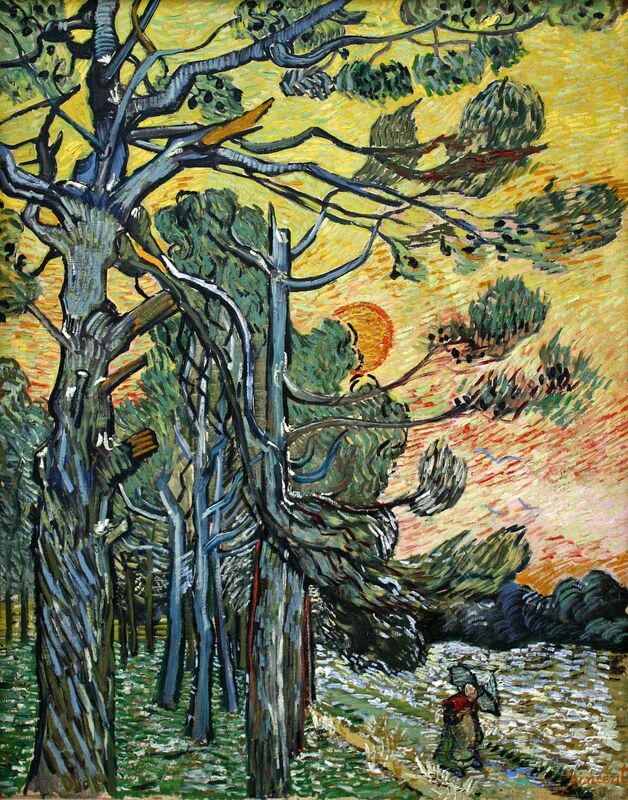 The Starry Night, painted from his asylum and swirling with the terrors of his illness, is nevertheless grounded by another visual trope—the cypress. Repeatedly painted by van Gogh in the south, it nevertheless is a reminder of the north and his childhood. 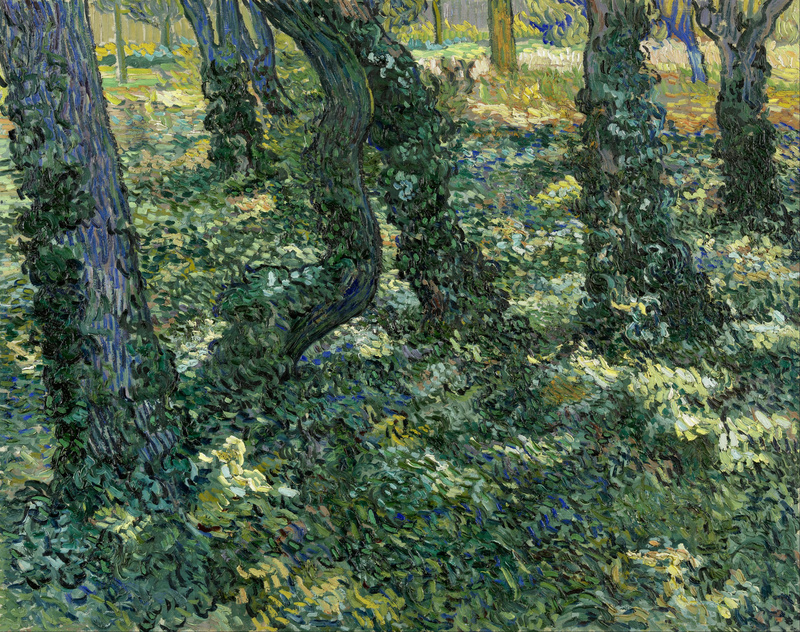 In the fall of 1888 van Gogh painted a large canvas for his bedroom, Reminiscence of the Garden at Etten. He described it his sister Willemien and even sketched it for her (November 12, 1888). Reminiscence of Garden at Etten. 1888. Oil on canvas. State Hermitage Museum. St. Petersburg. Not included in Clark show. Memories would haunt him before, during and especially after his hospital stays. And although he medicated himself with alcohol and sought his own treatment in brothels, the cure he always wrote about was Nature. When Theo was experiencing lassitude (or worse) as dealer at Goupil & Cie in Paris, Vincent diagnosed his ailment as soul sickness: “Don’t take it amiss if I say now that your soul is sick at this moment—it really is—it isn’t good that you aren’t part of nature—and I think that No. 1 now is for you to make that normal again” (October 12, 1883). 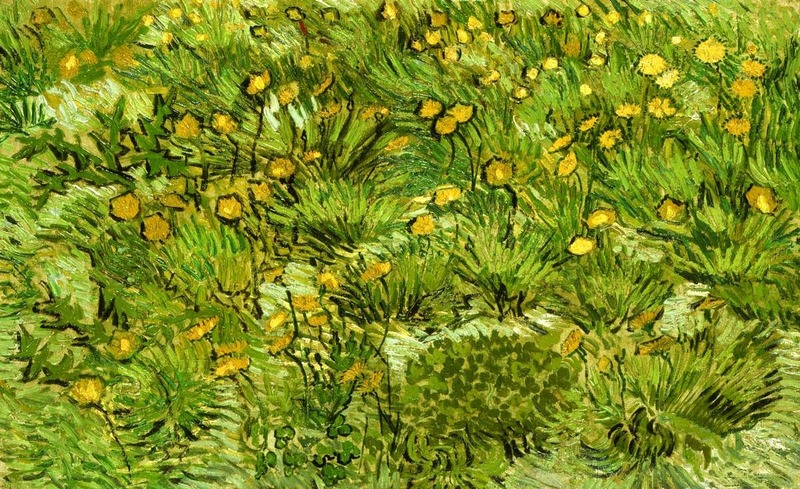 From his very first time away from home when he was 19, van Gogh prescribed himself walks in the woods or dale or hedge to restore his health and mental well-being. In retrospect, his many works showing small figures on journeys seem like meditations on this form of soul healing. In December 1889, half a year from his death, he painted Fir Trees at Sunset (#11). 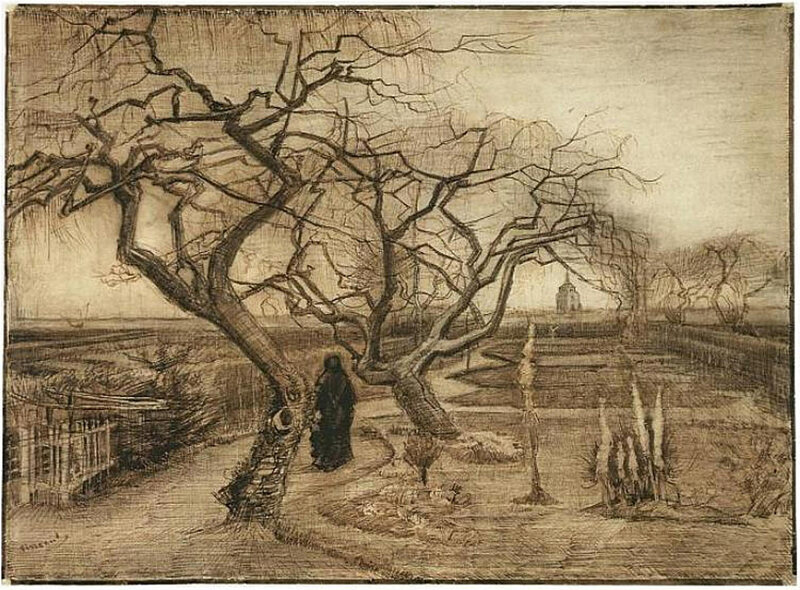 In the bottom right a small figure, probably a woman, travels in heavy wind, shown by her tilted parasol and the bending trees in the background. The towering trees in the foreground are all wind flagged 0n the left side by strong, persistent wind, likely the famed mistral of Provencal. (Paul Signac visited van Gogh in the hospital after his after his self-mutilation. Signac thought that the mistal had enervated him.) Three birds can be seen in the sky soaring on the wind beneath an orange sun whose light is emphasized by the orange strokes on the yellow sky. Seven years earlier when van Gogh was at The Hague (where Mauve and others remarked on his crudeness as an artist) he defended his manner of art to Theo: “[T]there are also people who, just as it is sometimes pleasant and invigorating for a healthy constitution to go for a walk when a strong wind is blowing, so there are also art lovers, I say, who aren’t afraid of the harsh” (June 3, 1882). Van Gogh, braced by that strong wind, had now gone all in on that bet. 31. Giant Peacock Moth. 1889. Oil on canvas. Van Gogh Museum, Amsterdam. Although van Gogh seemed to have finally perfected his mature style in Provence, he took up an entirely new style, reminiscent of his days as a child in Brabant and later when he painted the nests (#12). It involved close studies of natural history objects—not to express a mood or their inner essence, but their actual physical appearance, the way they were illustrated in natural history journals. In Paris he had sketched certain birds after graphic representations he had seen, such as the barn owl and flying swifts. 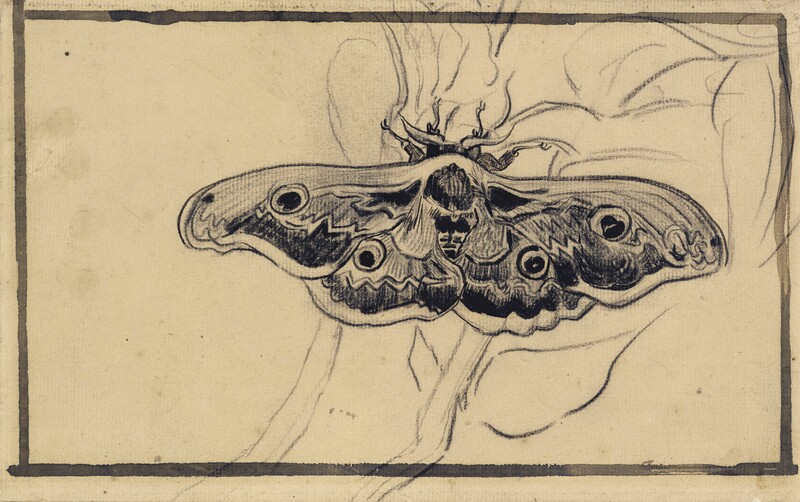 In Provence he drew dead birds (#1, probably from life) and moths (#10, possibly from a magazine or print), the weed known as tassel hyacinth (Leopoldia comosa), drawn, as was the moth, duirng his stay in the asylum (see to Theo, May 23, 1889). From these studies he made a painting of the peacock moth (#31) and another of butterflies among red poppies. Perhaps van Gogh was attempting something of an homage to Japanese art that was so much in vogue in those days. Perhaps he was intending to set off on a new direction. 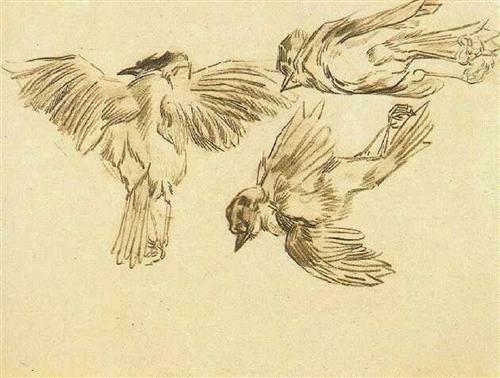 It would have been a radical departure, because aside from pairs of strokes to indicate birds far off in flight, van Gogh’s art is utterly devoid of animals. This could not be said of his models like Millet, Mauve, Delacroix and Monticelli. Even Puvis de Chavannes occasionally painted animals. If he planned a new departure, he never followed through (although he made many sketches of farm animals while institutionalized). Instead he continued in the same heightened proto-expressionistic style even when he moved to Auvers for the last months of his life (e.g., #3, 32 and 34). 32. Green Wheat Fields, Auvers. 1890. Oil on canvas. National Gallery of Art, Washington, D.C.
33. Undergrowth. 1889. Oil on canvas. Van Gogh Museum, Amsterdam. Most likely, his “naturalist” studies were exercises in nostalgia. Sister Lies recorded how the young Vincent would wander off alone to the streams, collect beetles, even the ones with “terribly long feelers” and equally long names, yet Vincent “knew them all.” He sought out “the woods and fields, watching and studying the life of the underbrush and the birds. The birds he knew intimately; knew where they all lived and had their being, and if he saw a pair of larks descend among the rye, he knew how to watch them closely, without even breaking one fine stalk of grain.” She summed up his childhood devotion to Nature lyrically: “With a thousand voices Nature spoke to him while he listened, but his time had not yet ripened into action.”‡‡ The nature studies in the asylum at Saint-Rémy may have been driven by his desire to return to the land of his youth. After all he confessed to Theo from there that “I have a terrible desire that comes to me to see my friends again and to see the northern countryside again” (September 10, 1889). As for “the life of the underbrush,” he once again painted Undergrowth (#33). Cottages at Sunset (Reminiscence of Brabant). 1890. Oil on canvas on panel. Van Gogh Museum, Amsterdam. 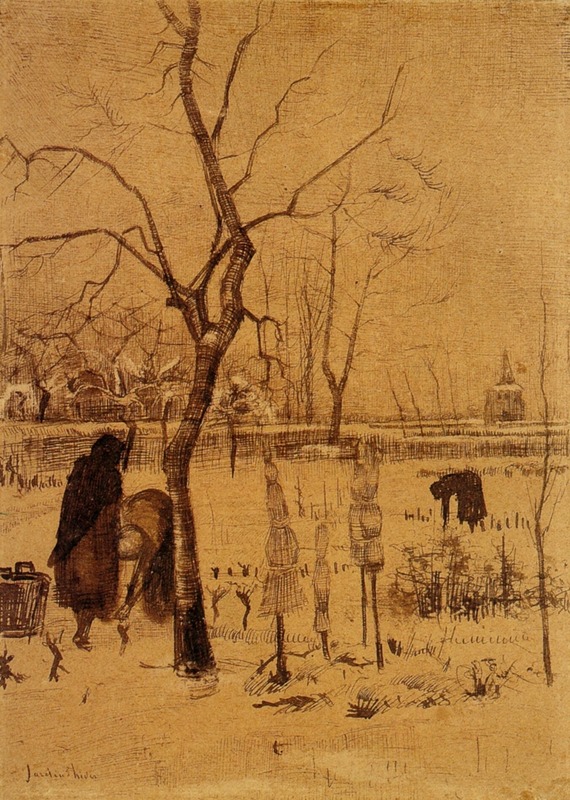 Van Gogh’s sketches in the asylum recalled the peasants of Brabant: Snow Covered Cottage with Figures, A Sketch of the Potato Eaters, Diggers and Other Figures, Diggers and Other Figures, Peasants Eating and Other Figures, Sheet with a Figures at a Table, a Sower and Clogs, Several Figures on a Road with Trees, Interior of a Farm with Figures at the Fireside, Four Men on a Road with Pine Trees and many more. The themes and shapes and atmosphere of Brabant all returned. And he painted three “Reminisces of Brabant” (e.g., Cottages at Sunset, right). 34. Auvers-Rain. 1890. Oil on canvas. Amgueddfa Cymru – National Museum Wales, Cardiff. *A printed version edited by Leo Jansen, Hans Luijten and Nienke Bakker is available in six volumes published by Thames & Hudson. ‡”Groningen Theology” in Walter A. Elwell, Evangelical Dictionary of Theology at 528 (2d ed.) (Grand Rapids, Mich.: Baker Academic, 2001). 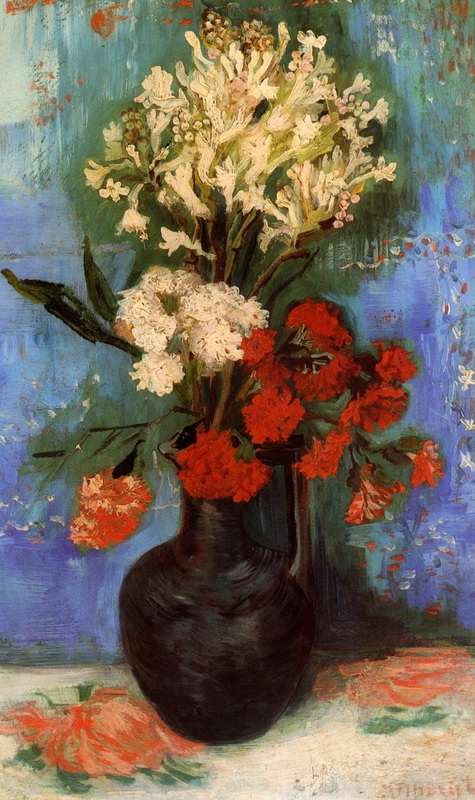 **According to Elisabeth Huberta van Gogh, Vincent’s younger sister by 6 years and called “Lies,” attributed the end of her brother’s relationship to Mauve’s “nervous and excitable” disposition, with the decisive event Vincent’s tossing a cast to the floor in Mauve’s studio when Mauve suggested he paint it in artificial light. She claimed he “could never see anything but the humorous side” of this event, and “as often as he would tell it, he would laugh over it …” Elisabeth Huberta du Quesne-van Gogh, Personal Recollections of Vincent van Gogh (translated by Katharine S. Dreier) (Boston: Houghton Mifflin, 1913), pp. 29-30 [“Personal Recollections“]. 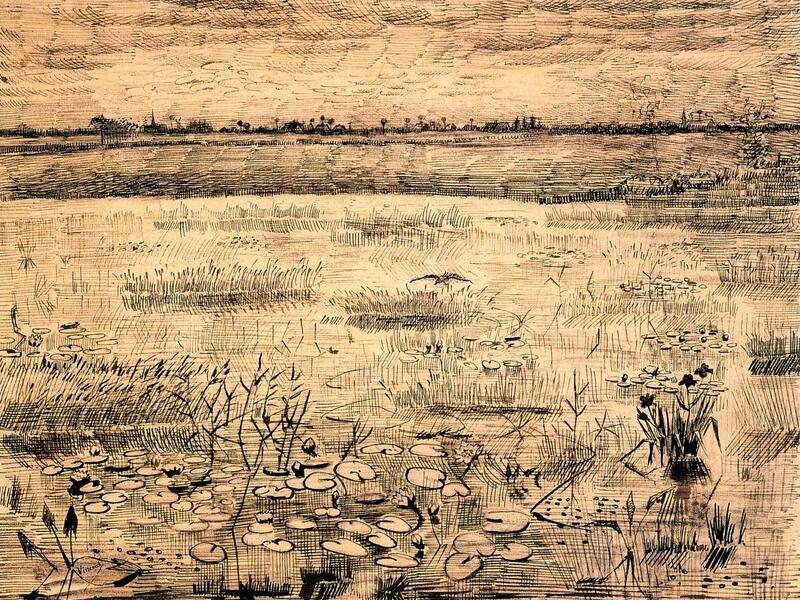 ††In September 1883 van Gogh left the Hague (as well as Sien and her two children) for Drenthe Province. In December he moves to Nuenen in the Brabant, where his parents had moved. In November 1885 he moved to Antwerp where he stayed for three months until he moved to Paris in March 1886. ‡‡Personal Recollections (see note **), pp. 5-6. Charles Chetham, The Role of Vincent van Gogh’s Copies in the Development of his Art (NY: Garland Publishing, 1976). Jane Clark, From Monet to Cézanne: Late 19th-Century French Artists (NY: St. Martin’s Press, 2000). Abraham Marie Hammacher, Genius and Disaster: The Ten Creative Years of Vincent van Gogh (NY: Harry N. Abrams, Inc., 1968). Abraham Marie and Renilde Hammacher, Van Gogh (NY: Thames and Hudson, 1990). Richard Kendall, Sjraar van Heugten, Chris Stolwijk, Van Gogh and Nature (Williamstown, Mass. : Clark Art Institute, Distributed by Yale University Press (New Haven, Conn.), 2015). Joseph Masheck (ed. ), Van Gogh 100 (Westport, Conn.: Greenwood Press, 1996). Stephen Naifeh and Gregory White Smith, Van Gogh: The Life (NY: Random House, 2011). Cornelia Peres, Michael Hoyle, Louis van Tilborgh, A Closer look: Technical and art-historical studies on works by Van Gogh and Gauguin (Zwolle: Waanders, ©1991). Ronald Pickvance, The English Influences on Vincent van Gogh (2nd ed.) (London: Arts Council of Great Britain, 1974). Wilhelm Uhde, Van Gogh (with notes by Griselda Pollock) (NY: Watson-Guptil Publications, 1990). Evert van Uitert (ed. ), Van Gogh in Brabant: Paintings and Drawings from Etten and Nuenen (translated by Patricia Wardle) (Zwolle: Waanders,©1987). Sjraar van Heugten, Joachim Pissarro, and Chris Stolwijk, Van Gogh and the Colors of the Night (NY: Museum of Modern Art, 2008). Charles Camille Auguste De Groux. Wonderful, well-researched post! About a year ago, the Art Institute of Chicago had a Van Gogh exhibit based on the theme of his famous work, The Bedroom. He apparently did three paintings of the bedroom. There were many other supporting works on display also. It was quite interesting. Actually, I thought I did a photo essay about it on my blog but I can’t find it.